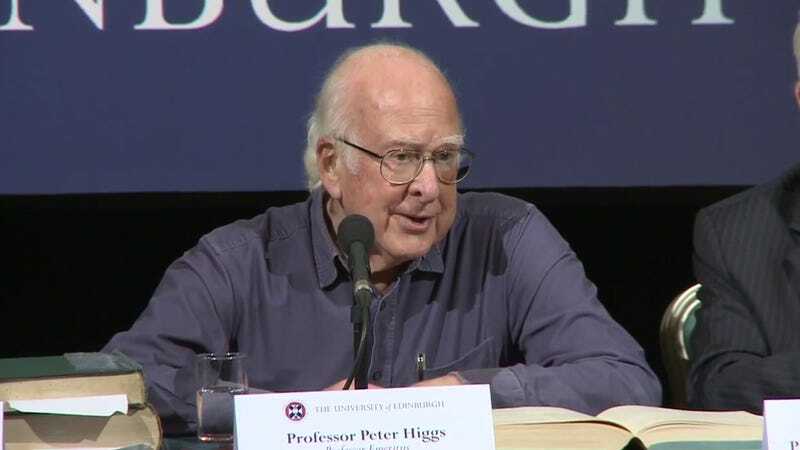 Peter Higgs, who proposed the existence of what would be dubbed the Higgs Boson, says that he wouldn't cut it if he were entering academic science today. Keep in mind that this dude won a Nobel Prize for physics a few months ago. Higgs did an interview with The Guardian while on his way to pick up his Nobel Prize, as one does, and was pretty candid about his lack of measurable productivity in the years after he published his major theory. During his time at Edinburgh University he says that he became "an embarrassment to the department" at assessment season when everyone else was showing off the papers they had published in a given year. Higgs retired in 1996 and attempted to further remove himself from the academic world, though he was eventually drawn back in a bit when the Large Hadron Collider at CERN started to have promising results. Higgs told The Guardian that, "Today I wouldn't get an academic job. It's as simple as that. I don't think I would be regarded as productive enough." To be fair, there was clearly tension about Higgs's lack of productivity during his tenure, so it's not as if there was a specific point in the last few years when consistent publishing became significantly more important than it had been. Also, Higgs would definitely not be employable today given that he "says he has never sent an email, browsed the internet or even made a mobile phone call." Yeah. There's that.